Credit cards can be complicated, with all the various features, terms and conditions, rates and fees, and requirements for card membership. The rules regarding how they work often change, as do the ways that credit scores related to credit cards are calculated. There are hundreds of different kinds of credit cards, too, and many different financial institutions that issue them. As a result of this being such a multifaceted financial product category, there are also many myths or misunderstandings related to credit cards. It’s always a good idea to separate fact from fiction in order to manage your finances knowledgeably, so we’ll point out 10 of the popular myths and explain why they aren’t actually 100% true. So many people pay just the minimum, thinking that will free them up from incurring financial penalties. While paying the minimum does help you pay down your balance, you still accrue expensive interest charges. Paying only the minimum can also eventually lead to you getting a lower credit score, which will potentially mean that any loans you take out will charge higher rates of interest. Plus, if you pay the monthly minimum but still use your credit card to make purchases, that increases the balance you owe going forward – which, in turn, increases the amount of the minimum payment required. All of those factors can conspire to create some treacherous credit card debt circumstances, so it is always best to pay more than just the bare minimum, if at all possible. In the long run it will save you money instead of guaranteeing that your credit card company makes lots of extra money off of charging you high interest. Debit cards and credit cards are two different animals, and the main thing that separates them is their connection to your money. A bank debit card taps directly into your checking account, but a credit card only ties to your credit card account – which does not contain any actual cash, only a line of credit. If someone steals your debit card they could potentially steal everything in your checking account before you realize it. But if they steal your credit card, as long as you report the theft promptly, your liability is limited to about $50. Generally both debit and credit cards are safe to use if you practice common sense. But when you have a choice – and are transacting business anywhere except an ATM machine – it may be prudent to use your credit card instead of a bank debit card. It is covered by more protections, which gives you an added layer of security. 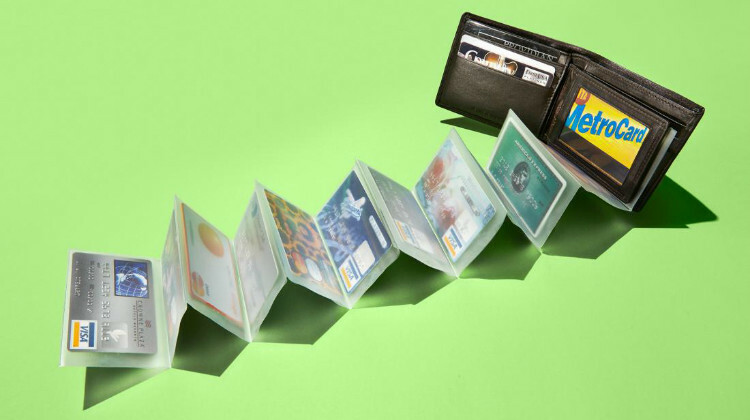 Each credit card has a spending limit, based on your credit worthiness. Your limit might be $250, $500, $1000, $10,000, or whatever the card company assigns to your account. You can make purchases or charges up to that maximum amount, and if you pay them off it frees up more credit to use. But if you close your account, that also effectively closes down that credit line or spending limit. Doing so shrinks the amount of available credit you have, which can – in turn – shrink your credit score. So cancelling cards does not help your score, and it can possibly weaken your score. What does help, however, is paying off your balance and then keeping the account active – so that the availability of credit in your name remains in your credit files. Those who say that to increase your chances of getting accepted for a credit card you should apply to as many as possible are mistaken. That’s a myth. Each time you apply for a credit card the bank checks your credit history, and if your credit history is checked multiple times within a short period of time, it can weaken your credit score. So if you do want to apply for a card but are not sure if you are eligible to be granted a credit card, first do some research. Find out what range of credit score, for instance, is necessary to qualify for a particular card. That helps avoid the possibility that you will apply and just be rejected. After you know which cards you have the best chance of qualifying for, narrow down the choices and pick one. Then apply for it. After you are accepted, if you need another credit card, pick another one from that list of “high probability that you will be accepted” cards. That’s the best strategy, while applying for lots of cards all at once is not such a good idea. Cutting up your credit cards does not actually close down the account. To officially do that you need to call your credit card company and ask them to close the account. You should also request a letter or final account statement that is their confirmation to you in writing that they have closed the account. Only then is the account actually terminated. But if you want to avoid the temptation of using your plastic, you can cut up your credit cards. Just keep in mind that the account will remain open and will still be considered active until you take steps to close it or either the card issuing company takes step to close it because of a lack of credit card activity. Some people think that if they send in a payment for slightly more than they owe on their outstanding credit card balance, it will help improve their credit. But it doesn’t, so instead you should just pay off the exact balance and not pay extra. The reason that overpayments don’t help to raise your credit profile or score is that when you overpay, even though your credit card company will show a credit on your statement, that extra amount is not reported to the credit reporting agencies. All they will get is information stating that you owe no outstanding balance. So a better use of your cash is to pay off another debt or put it into savings, rather than using it to overpay your credit card. There are so many companies that will help you monitor your credit score for a fee that many credit card members believe that paying a fee is the only way to track your credit score. But these days there are several credit card companies that give their credit card customers their credit score for free, every month, as part of their customer service features. If you want to check your credit score frequently, without having to pay for that access, just carry a card that includes free credit scores in its package of cardholder benefits. One example of a company that does this is Discover Card, but there are also others offered by other card companies and banks. Lots of people who have credit cards are afraid to sign them on the back, in the space provided for the authorized cardholder’s signature. That’s because they are afraid someone will steal their card and then forge their signature. But legally speaking, if your card has a space on the back for your signature then the credit card is technically invalid unless and until you sign it. That is just the legal policy of the bank that issued the card, so if you carry a credit card, go ahead and sign it where appropriate. Otherwise a retail merchant has the right to refuse to honor the card. Having chip cards is definitely a step-up in terms of credit card security, but it is a myth that the cards now available in the USA are foolproof and totally secure. For one thing, they still have a rather vulnerable magnetic stripe on the back, and that technology is decades old. But the biggest vulnerability is that they require only one-stage authorization. You insert the card and that’s it. The cards widely used in other major nations like the UK, however, require that you also enter a personal ID number or PIN. That’s why those cards are called PIN and Chip, not just Chip cards. Having to enter a secret 4-digit code, the way you do when you use an ATM bank card, adds a whole extra layer of protection, so that it becomes very difficult for a criminal to hack your card. What this means to you if you have a standard-issue chip card in the USA is that you still need to be careful how and where you use your card, and monitor your credit card account to ensure that nobody can get away with fraudulent transactions. Sometimes when you go shopping at a mall department store or other box store, the clerk will offer you a chance to get a discount on your purchase if you apply for an in-store or “branded” credit card or charge card. But most of these are only accepted at that particular store or company, and you cannot use them elsewhere. They generally charge rather high rates of interest, and if they have rewards programs those are usually not as generous as the ones offered by full-fledged credit card issuers. So if you need a credit card or rewards program, shop around for the best one you can find. Don’t limit yourself to the one offered by your favorite retail store. The idea that those are a great bargain compared to other cards you can find these days is basically a myth or exaggeration.